This new board is a breakout / development board for the AMS AS3935 Franklin Lightning Sensor. For those waiting for the newer version, I've been continuing to work on the prototype for version 2. Some of the new functionality that has been planned includes a microcontroller on board for easier integration with existing systems, as well as an lcd display port for an optional display. The additional functionality and required board size will bump up the price a bit, but I still expect it in the $40-$50 range. This new version should be ready approximately July of 2014, and will be listed as a separate product here on Tindie. A few weeks back I was browsing some vendor sites and found what is probably one of the coolest new products i’ve seen in a while. It’s an IC that can detect lightning! Once I saw it, I knew it was only a matter of time before i’d have a board in the works, and here it is. 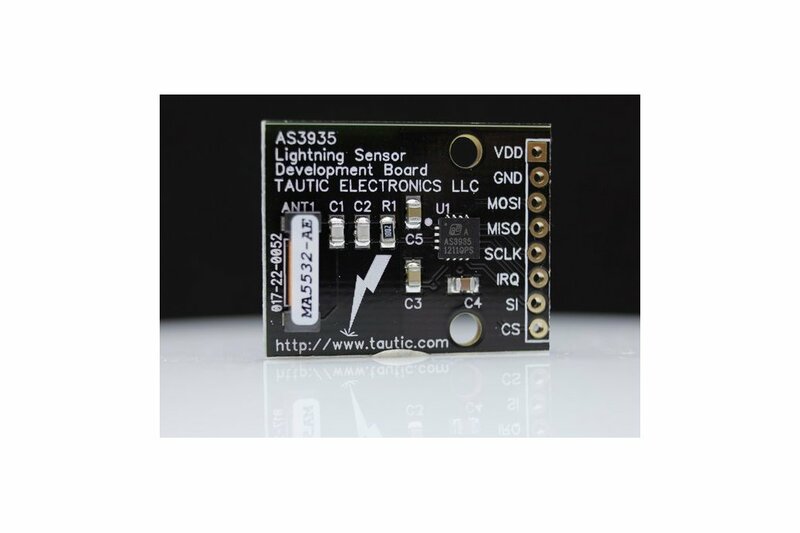 This new board is a breakout / development board for the AMS AS3935 Franklin Lightning Sensor. This is a super cool little IC, capable of detecting lightning strikes up to 40km away, and will estimate distance to the leading edge of a storm with some neat internal processing. The board I’ve developed is set up with the required components to get the IC running and includes the proper antenna designed specifically for the AS3935. The back side of the board has spots for the two pullup resistors required for I2C operation should you require them. The IC is set up to run anywhere from 2.4 - 5.0vdc. Details on interfacing with the IC are available on the datasheet available from AMS. Neat board, and it works! I took a different tack than most people (I always do...) and I wrote my own library for this chip from the ground-up to gain maximum familiarity with the chip's inner workings. I wrote a library for Energia (Arduino/Wiring variant for TI's LaunchPad ecosystem) - https://github.com/spirilis/Franklin - and implemented a logging sketch using their MSP430FR5969 Wolverine LaunchPad, which has a non-volatile alternative to flash (called FRAM) so you can store information for later retrieval in a very-low-power and easy-to-use manner. A logging sketch with some level of auto-noise-floor management has been running for a week and today we finally had some decent storms rolling through the area. Many thanks to TAUTIC for carrying this board, it's a unique product and I plan to include it in some future motorcycle projects! The doings is going at the top of a 75 foot tower which also carries antennae for the local fire service. The idea is to a:) keep an eye on lightning strikes out in the western (grassy) plains, and b:) to enable crowbar protection of the the masthead gear when lightning gets too close. I've still got to get to the top of the tower, so please stand by. I have 3 of these devices now,and as luck would have it, never a storm to be seen despite this being the Storm Season in September in QLD Australia. I have data from one sensor showing here. If anyone is getting good reliable data, can we see a link to it? I bought 4 of these, but they haven't successfully detected lightning yet when storms have been overhead or in the distance. I've tried a number of things, including changing noise levels, gain levels and placing the sensor by a window. I get the occasional IRQ generated, when I make the device more sensitive than the defaults, but I haven't had one lightning stroke detected yet despite seeing / hearing approx 400 strikes over a couple of weeks (cloud to cloud and cloud to ground). I am still exploring this Board. I added timestamp via RTC to the example from the AS3935 library. Fact is for the moment: I recieving something: Some disturbers and maybe 0-3 lightnings per day with perfect weather. On the other side: I live in a wide valley in the swiss alps and was surrounded by storms (pic). Visible lightnings all around, but no detection from the board. Right now i have a warning about "Storm overhead, watch out" I compare with blitzortung.org where are no activities in 1000 km radius. Maybe it has something on the Airforce Airbase 5km's away.